Killing Them Softly revels in the cynicism of its central character of Jackie Cogan (Brad Pitt), a hit man who stalks the noir lit streets of an urban American society suffering from a monstrous moral and economic decadence. It’s not a fantastical decadence but one rooted in a stark contemporary reality in which the terms recession and capitalism have led to a social crisis of confidence. The absence of morality is nothing new to the crime genre but here it seems to be absolute in the way Jackie views his role of the hit man nothing more than a professional service. With Jackie, all that exists is the job. He has no external life to speak of and trades in death. He also occupies a universe of unsavoury characters that collectively represent a dispiriting American underbelly often found in some of the more nightmarish visions of America from 1970s cinema. The fact that we find no difference between the amorality of Jackie from his victims is what makes the film’s representation of American society so powerfully dark. We have no one to root for in the film and in many ways we become observers rather than traditional participators. Such an observational and at times detached spectatorial position underlines the way director Andrew Dominik chooses to foreground ideological concepts over more visceral conventions associated with the genre. Most of the film hinges on extended conversation sequences while in the background we hear America’s transition from Republicanism to Liberalism (punctuated with speeches delivered by Bush and Obama) as a nothing more than historical spectacle, stressing the continuing empty promises made by politicians. In many ways, Jackie is a twisted metaphor for the contemporary entrepreneur and although he deals in death his violent preoccupations are a pale reflection of successive American leaders. However, what separates Jackie from someone like President Obama is the refusal to use hypocrisy as a form of persuasion. For Jackie, his profession as both an enforcer and hit man is devoid of such traditional forms of political hypocrisy; instead he deals in a reality based on choices and ultimatums, thus avoiding any potential personal guilt. In fact, Jackie is unique in the pantheon of cinematic enforcers/hit-men since existentialism is traded in for an ideological bent. Such ideological musings transforms Jackie into a vicious political metonym and repressed voice for disillusionment with the establishment that stretches back to the 1970s. 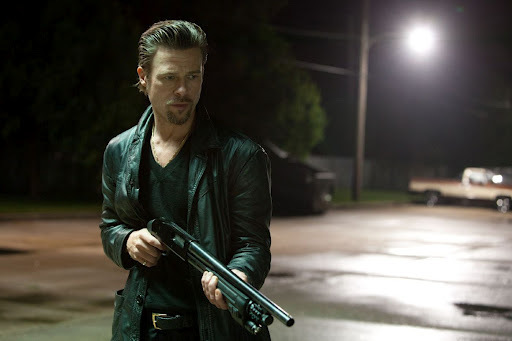 Just as The Assassination of Jesse James By The Coward Robert Ford offers a revisionist dissemination of the western genre, Killing Them Softly also undermines audience expectations associated with the crime film genre. The plot is perfunctory and offers little variation in what we have seen before in the American crime film. Two desperate criminals hold up a card game run by the mob, resulting in the entrance of enforcer Jackie Cogan who takes on the job of resolving the crime. The film is adapted from a 1974 novel ‘Cogan’s Trade’ by George V. Higgins who also wrote The Friends of Eddie Coyle. Dominik updates the story to 2008 but such prescient political and economic parallels exist between the two eras that I doubt if the film really loses any of the 1970’s context. The Friends of Eddie Coyle, directed by Peter Yates, features one of Mitchum’s greatest performances as an ageing small time criminal who becomes an unlikely police informant. The patina of romanticism often found in some of the more celebrated American crime films is largely absent from the writing of Higgins. Dominik appears to remain faithful to Higgin’s unglamourous depiction of the criminal underworld by opting for a neo noir aesthetic echoing the dirty, bleached out look that defined films such as Taxi Driver, The Outfit and Thief. Absent also is the traditional face of the crime boss who oversees the hierarchical power structure. Such a choice means that the action stays firmly rooted in the urban milieu of peripheral low life characters typically marginalised in crime or gangster films. The film isn’t wholly devoid of action, with a stand out assassination sequence involving hypnotic slow motion, shattered glass, shell casings travelling through rain and the sounds of Kelly Lester’s ‘Love Letters’. Perhaps the defining moments of the entire film is the final scene between Jackie and the ‘middleman’ (Richard Jenkins). Staged in a bar and brilliantly juxtaposed to a television set broadcasting the acceptance speech of the newly elected President Obama, Jackie’s cynical diatribe on the state of America as defunct, individualistic and pathologically obsessed with money may seem somewhat polemical and unexpected for a crime film but its power comes from watching A list film star Brad Pitt deliver such words, and all with an eloquence and clarity. With Assassination of Jesse James and last year’s Tree of Life, Brad Pitt certainly doesn’t need to convince the sceptics of his growing capacity as a fantastic actor and Killing Them Softly offers yet another brilliantly charismatic performance, if not, his best to date. As Jackie Cogan, Pitt is scary, charming and deeply pessimistic, modelling his washed out grungy appearance on a decrepit Elvis. This is an angry and prescient piece of cinema that could in time be considered a masterful addition to the American crime oeuvre. One of the films of the year for sure. This is a well-argued piece Omar but I can't go along with your very positive take on the film. The politics element via the TV and radio speeches didn't work for me. I confess that Brad Pitt doesn't do anything for me either. I'm intrigued by your reference to a decrepit Elvis. I'm not sure what it means – you don't just mean the slicked back hair? If we're going for pop star looks, Pitt has always struck me more like one of Elvis' 'pretty boy' rivals. There doesn't seem anything behind the looks – perhaps that makes him your perfect cynical hit man? I do think that the film is well-made and I've read a lot of positive reviews. I like your phrase about the 'patina of romanticism' but for me Killing Them Softly lost something in adapting Higgins. I think Dominik is trying too hard and a bit more restraint would have been a good thing. This entry was posted on September 22, 2012 by Omar Ahmed in 1970s, Andrew Dominik, Brad Pitt, Crime, Death, Gangster, Ideology, Obama, Political Cinema, Thriller, Urban.